The second installment of Disney's Epic series will be cross-platform with coop. A newsletter section written by (then subsequently deleted by) Disney seems to have prematurely announced Epic Mickey 2 and outlined a new split screen coop mode. According to the write-up, the game will be released for Christmas of 2012, and unlike its predecessor, will be cross-platform, reaching the Wii, Xbox 360, PS3, and PC this time around. The news also included a major addition: coop play, which will star Oswald the Lucky Rabbit as a sidekick able to "fly like a helicopter" and "solve challenges." Oh, he can also fight people with lightning. Disney Epic Mickey 2 is the latest game in the critically acclaimed Disney Epic Mickey videogame series. In this all-new action-platforming game available for Xbox 360, PlayStation 3, and Wii, Mickey embarks on an epic journey and is pulled back into a world filled with Disney's forgotten characters. Players can choose to play single-player as Mickey or for the first time players can also choose two-player split screen mode. In the two-player mode one person can play as Mickey wielding magic paint and paint thinner to dynamically change the world and the second player can play as Oswald the Lucky Rabbit - Walt Disney's first cartoon star - with the power to fly like a helicopter and use electricity to fight or friend enemies and solve challenges. Team-up and choose your path to save this forgotten world because the choices you make will alter the story and change the end of the game!" Disney has yet to officially announce the title, but this rumor seems all but 100% confirmed. 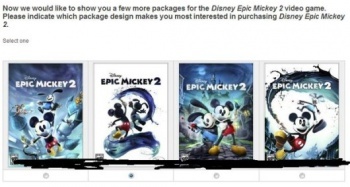 Back in August, we saw complimentary evidence in the form of customer surveys asking players to vote on box art featuring Oswald (which you can see above) and three potential titles for the sequel: Epic Mickey 2: Return of the Mad Doctor, Epic Mickey 2: The Power of Two and Epic Mickey 2: Mystery on Mean Street. After such a concrete leak, it likely won't be long before Disney hits us with an official confirmation.